Mad Monkey Cairns offers affordable upmarket hostel accommodation right in the centre of Cairns City. We are often referred to as the “Flash Packers” of Cairns due to our designer kitchen/bathrooms, modern décor & brand new air-conditioners in every room (Fully renovated 2017). Guests can enjoy FREE ultra fast Wifi, FREE hot breakfast, FREE large security lockers (BYO padlock) & brand new top quality mattresses/pillows/linen all new in 2017. The Mad Monkey Family create the perfect atmosphere with our outdoor pool oasis, cool sunbathing cabanas, outdoor bar with super cheap drinks, & a gourmet pizza restaurant located on site (Opening 28th March 2017). Our entertainments team organize events in the hostel every day & night before showing our guests to the top backpacker bars offering cheap eats & drinks in this iconic area. Great atmopshere and location! Loved my stay here! Had a great stay at this location. Staff was very friendly and helpful. Clean facilities and great complimentary breakfast. Loved the venue, loved the rooms and strong WiFi. Much more chilled out. Great social space in the middle of the hostel, and beds were super comfy. Good AC and WiFi in all rooms a massive bonus in the Cairns heat and humidity! Great location, comfy beds, big lockers for storage. Great cinema room, incredible WiFi, good sized kitchen but it is annoying when the pizza shop use the hobs to cook on. About 10 minutes from greyhound bus stop. Would stay again! Overall it was a little disappointing. The bathrooms were kind of gross and dirty which is probably what I would personally like to be the cleanest part of a hostel. 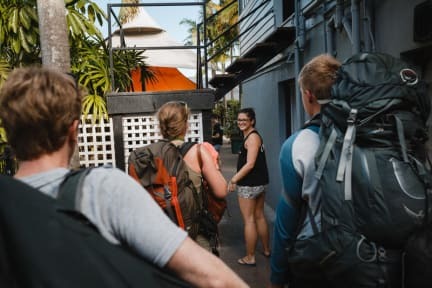 The atmosphere was okay but I was hoping it'd be a bit more inviting and engaging but the activities at the hostel were not run very well as to get people involved and facilitate a great community experience. Our room was nice and had air which was nice, and some of the staff was very friendly. Okay place to stay. Positives: good location. staff were very friendly and informative. Free breakfast was a bonus, cereals, toast and fruit juice. Also get free use of gym genisis which is just round the corner. Negatives: cleanliness of the hostel lets it down, bathrooms are old & not very clean. For the size of the hostel the kitchen is small & most of the hobs and ovens don’t work. Make sure you take a shower before 7pm, we made the Mistake of taking a shower after 8pm and it was COLD!! !